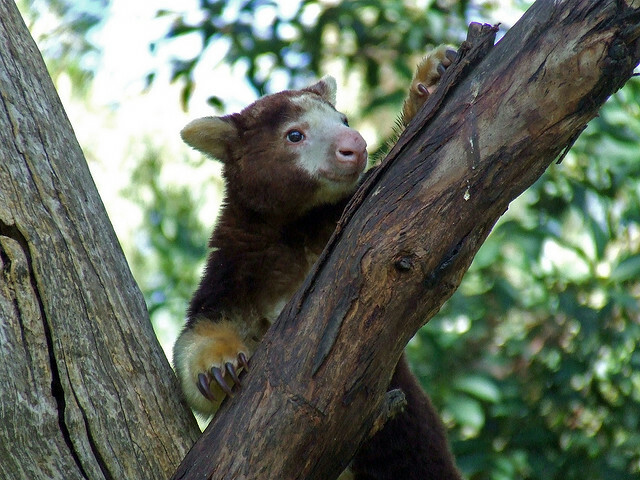 The tree-kangaroo belongs to the Macropodidae family which included the likes of wallabies and kangaroos. They are found, as you might expect, in Australia where they live in north-eastern Queensland. 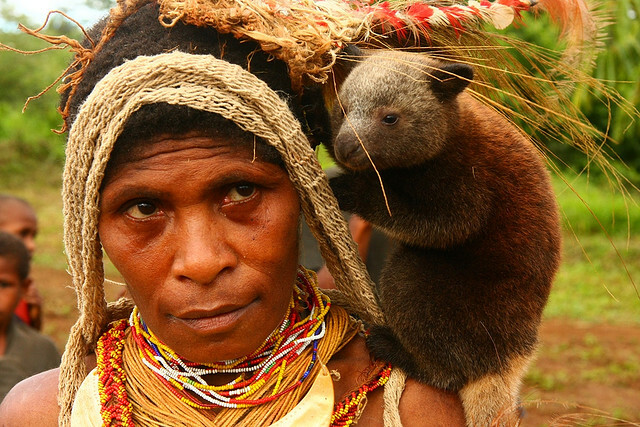 They are also found in the rainforest of New Guinea and there are twelve (or so) species on the planet at the moment, though all are considered under threat of extinction. 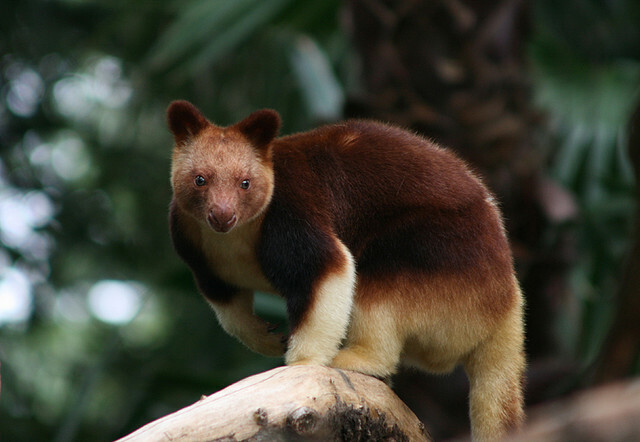 The striking difference between the tree-kangaroo and its land-based cousin is, of course, the choice of habitat. 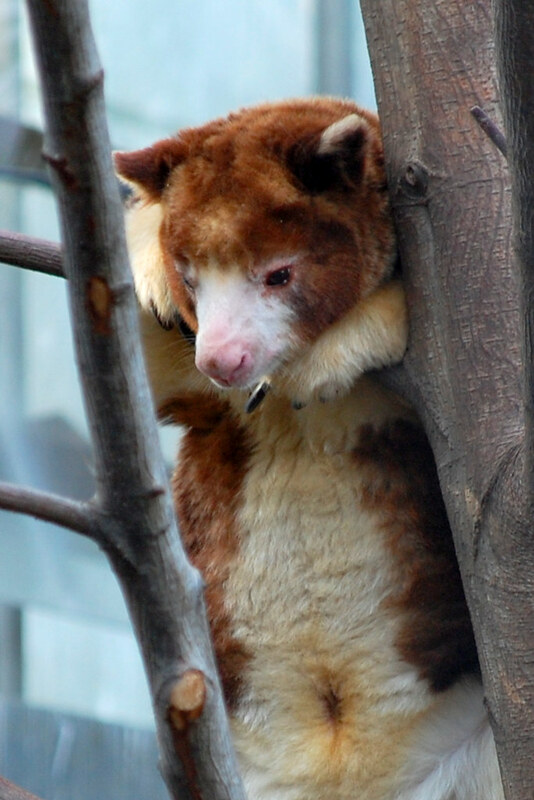 All kangaroos are thought to have arboreal ancestors which looked a little like today’s Australian possums. 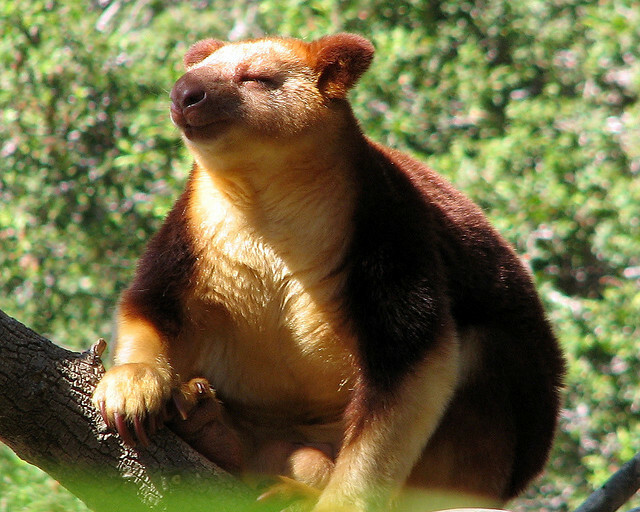 Macropods diverged from this line when they came down from the trees and on to the ground, evolving bodies that were adapted for speedy movement. 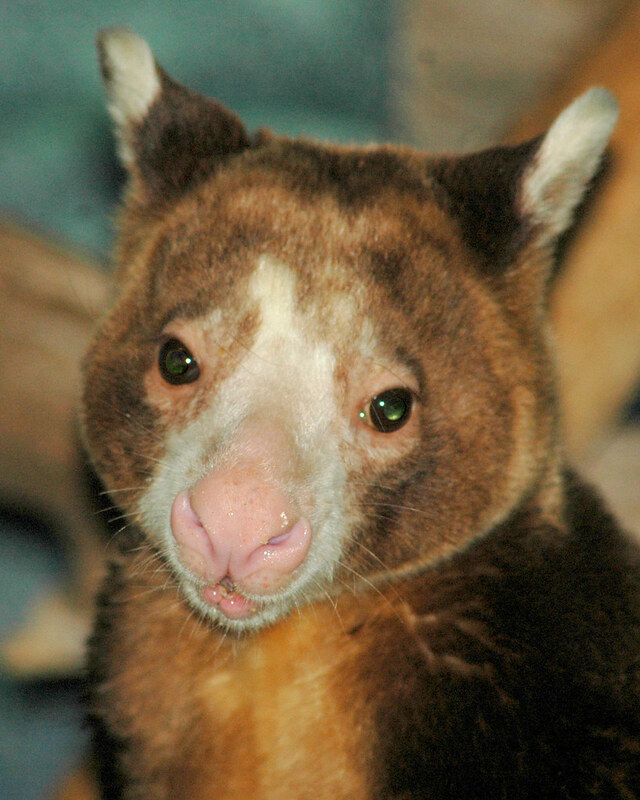 You can see those adaptations still when you look at a tree-kangaroo. 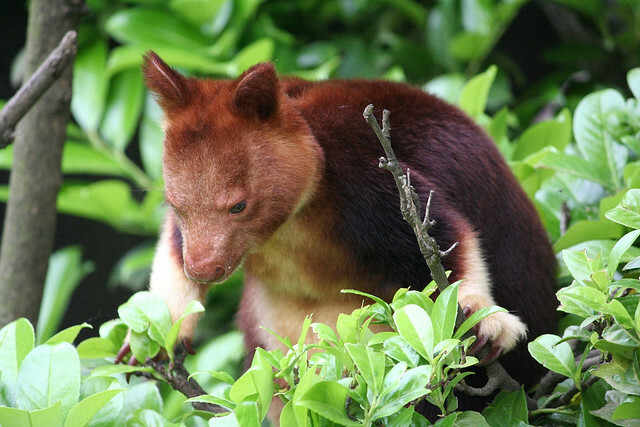 They have enormous hind legs together with elongated, slim feet. Yet then the differences start to show. 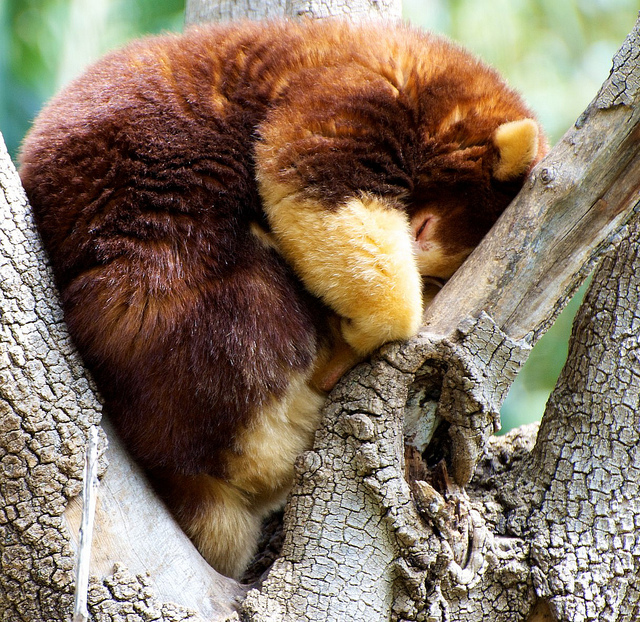 The tails are hugely long – allowing the animal to balance among the branches. Then there are the forelimbs. 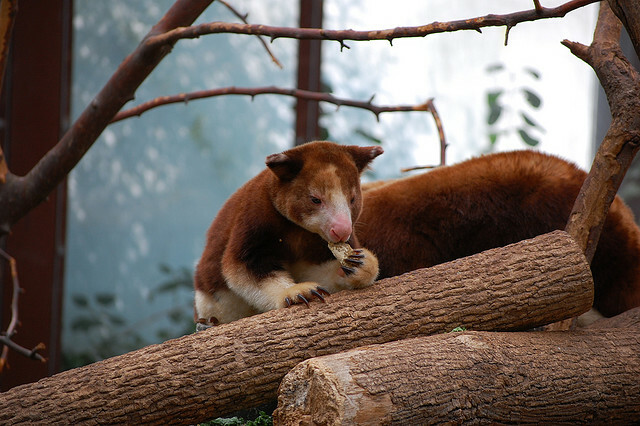 While ground based kangaroos have short forelimbs the tree kangaroo has arms that are much thicker and stronger and are about the same size as it hind legs. 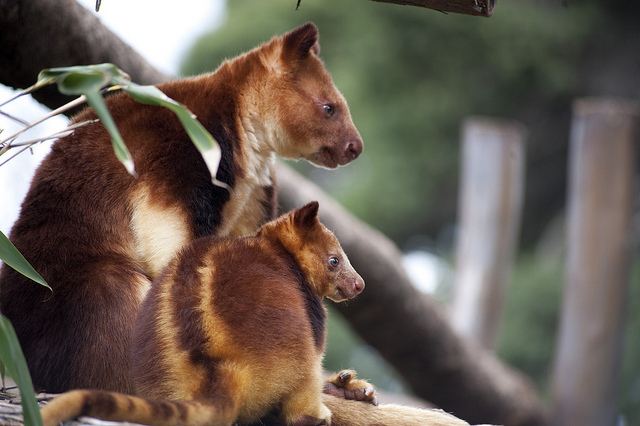 About five million years ago these marsupials decided against life on the ground. Quite why they went back to live in amongst the leaves is not known but educated guesses can be made. Perhaps the best guess is that as the species spread they encountered land where there was very little open ground so the trees made a sensible new home. It could be that the return was precipitated due to climate change and that the best diet was to be found among the branches. It could also have been a need to escape becoming lunch for predators. What is known is that natural selection kicked in and those who were more suited and able to live above ground survived and passed their genes on to the next generation – and so on. 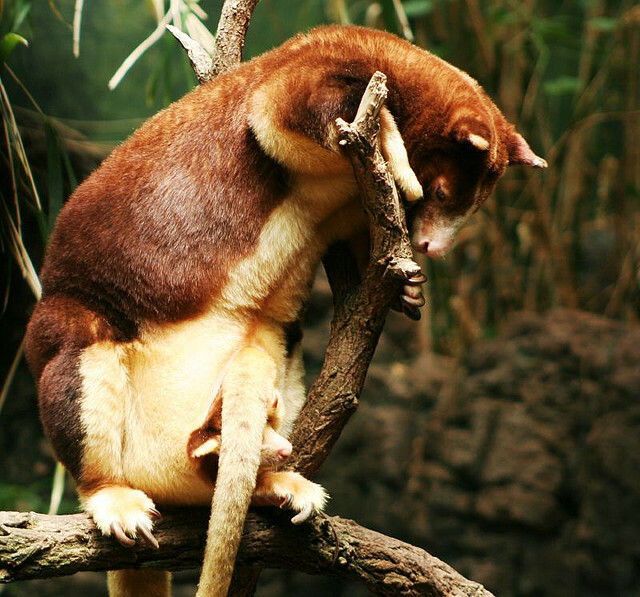 Certainly the modern day tree-kangaroo is very unsteady on its feet on the ground. They cannot attain speeds of more than walking pace and seem very sluggish and ungainly in their movements. Even the famous kangaroo hop has been reduced to an awkward skip. However, give them a tree and they are in their element. They climb boldly, without fear and with the agility of an Olympic gymnast. They climb by first wrapping the forelimbs around the trunk of a tree. 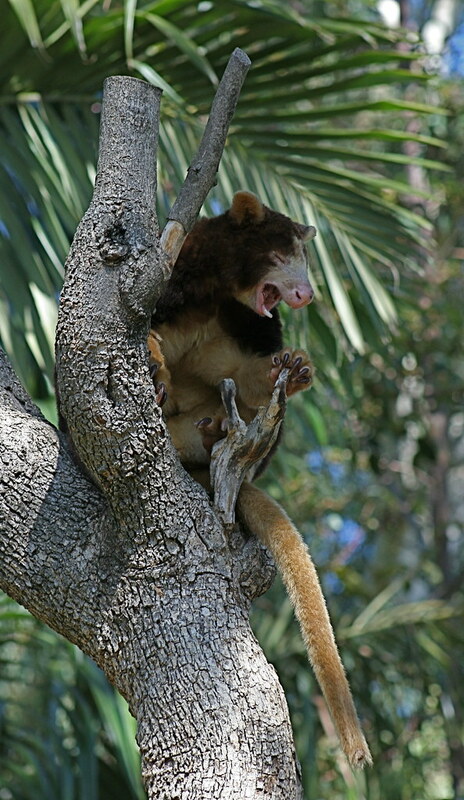 Then they use their strong hind legs to hop up the tree, letting their forelimbs loosely glide up the trunk. Leaping is something else entirely and where they really come in to their own with staggering distances being measured. 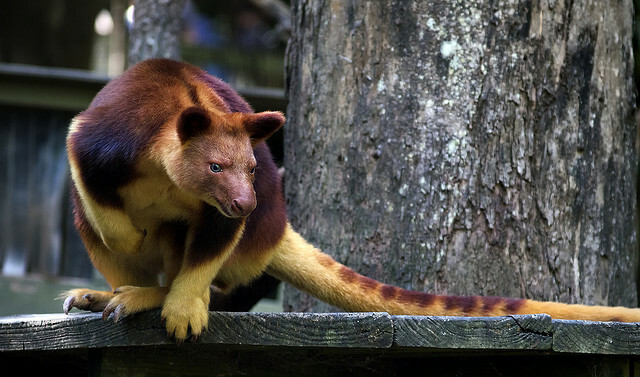 They can jump from one tree to another to a distance of 9 meters (30 feet). 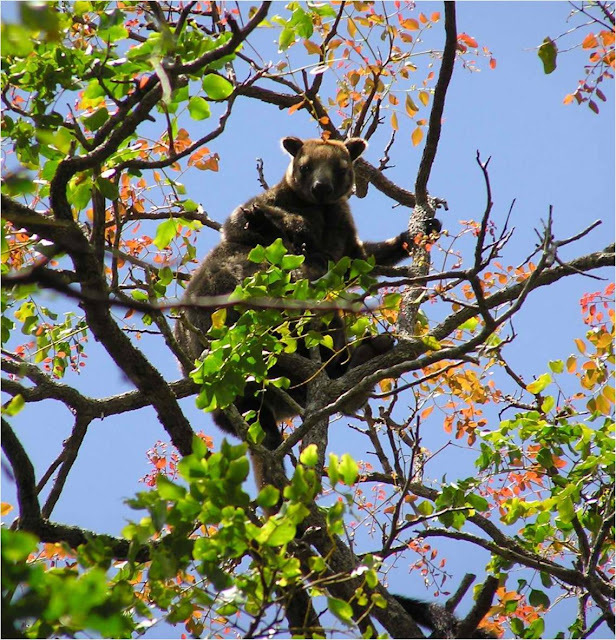 They have also been seen jumping from the heights of trees to the ground, plummeting gracefully through distances of up to 18 meters (almost sixty feet). 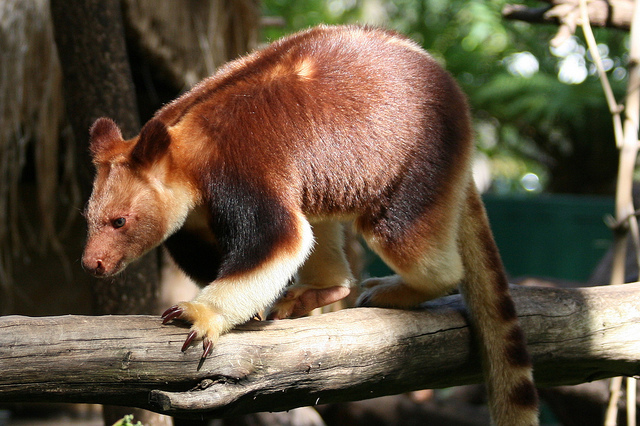 Tree-kangaroos do not have a great deal to do with each other unless it is the mating season. 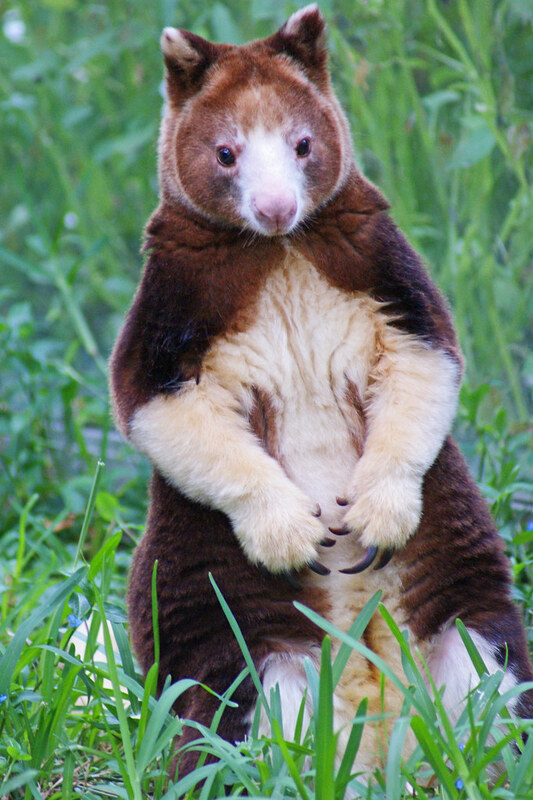 Once mating has occurred a joey will make its way to the mother’s pouch where it will remain for up to a year. Even after that it will continue to feed on its mother’s milk for several months. 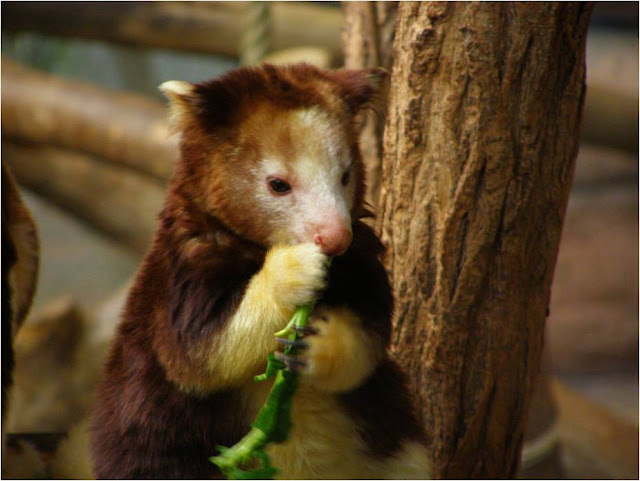 Their diet is consumed mostly above ground and consists of the leaves and fruit of the trees in which they live. 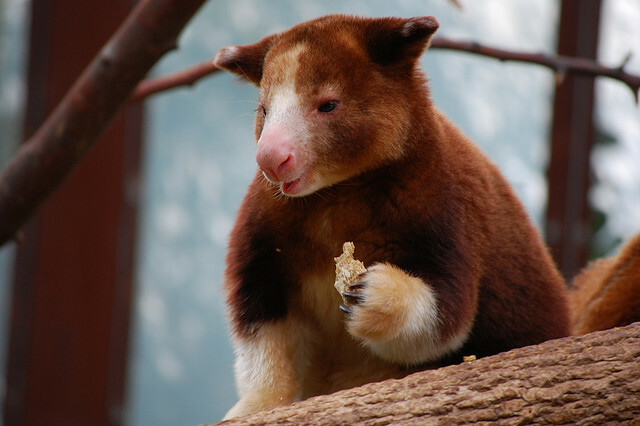 However, they will also eat flowers, bark and eggs. They have also been known to take young birds so are not as entirely herbivore as their better known cousin. This remarkable family of species is yet another reminder of the diversity of life on this ark in space.